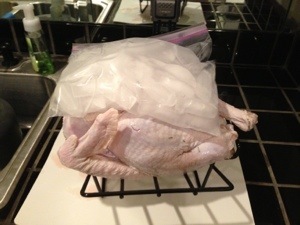 Well, the Thanksgiving turkey has been brining for about 3 hours now. I’ve gone ahead and loaded the Egg with more coal than the last cook. 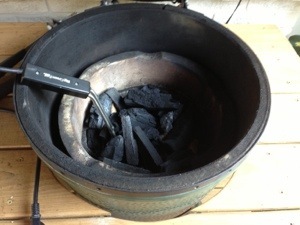 The coal is well above the top of the fire bowl this time around. Given the results of a 10 lb turkey taking about 2.5 hours, I’m expecting the 13.5 lb bird to cook for about 3.5 hours tomorrow. Maybe as much as 4 hours. I guess we’ll see. I’ve been asked to carve up the bird before leaving the house tomorrow. So, the plan is for a pretty early morning tomorrow. Lunch is planned for 1 pm. To give myself time for the turkey to run long, I’ll probably start the fire by 7 am. So, as most first tries go, the cook wasn’t perfect. For starters, the 2 gallon Zip Loc bag leaked into the stock pot where I was brining. It never overflowed, but emptying the pot was a little messier than I planned for it to be. Also, as it turns out, I didn’t pack the Egg with enough coal and my fire ended up almost out after about two hours. The embers were still burning, but there just wasn’t enough coal to maintain the 350F dome temperature. Luckily, this didn’t end up being a disaster and because I noticed the dome temperature was down to about 300F. Frankly, the turkey would have probably finished fine in the Egg (the ceramic retains heat for a ridiculously long period of time), so I wasn’t in any immediate danger of the grill going cold. It just would have taken longer than 2 1/2 hours. 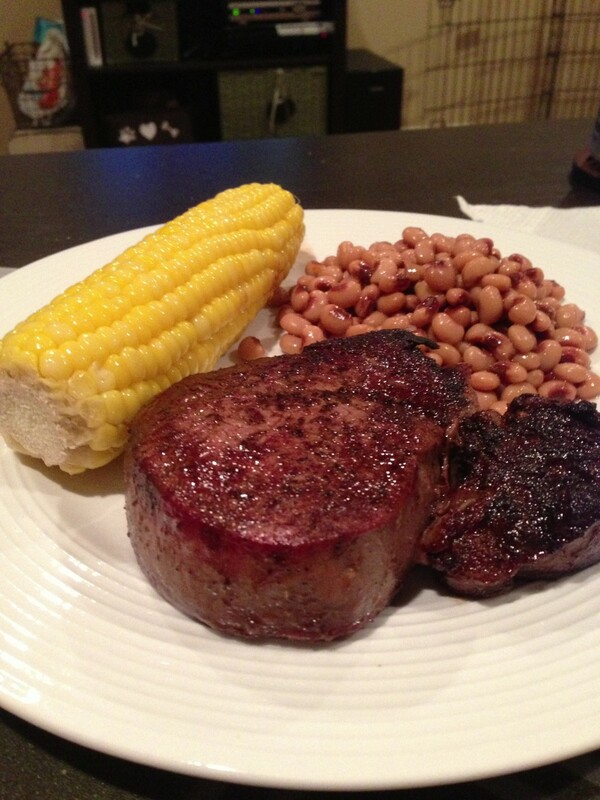 This also didn’t impact the smoke or the moisture of the meat. 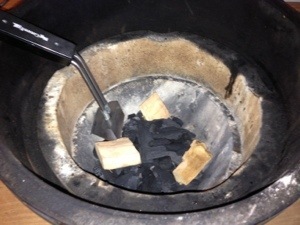 Meat only takes on smoke until it reaches a surface temperature of about 140F. Since we’re cooking to 165F/180F and it’s been two hours at 300F+ already, we’re already past that point. For Thursday’s turkey, I’ll definitely use more coal so that it finishes on the Egg and not in the oven. I preheated the oven to 350F and moved the entire assembly, including the probe thermometer from my grill to the oven. My aluminum drip pan barely survived the trip. About 20 minutes later (near the two and a half hour mark), the audible alarm on the probe thermometer went off. I grabbed my thermopen and checked. 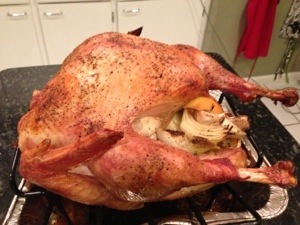 The breasts were just shy of 170F. The thighs were about 175. 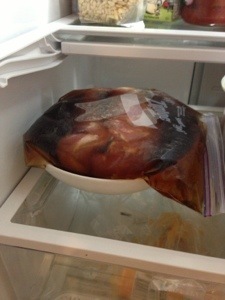 The magic trick with the bag of ice cubes worked, but perhaps I’ll give it 30 minutes next time. I gave it another 10 minutes just to be safe. 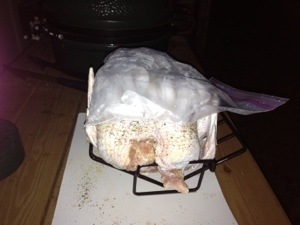 I tented the drip pan and V-Rack with aluminum foil and let the meat rest. While this is happening, the meat actually continues to cook. Once I unwrapped everything, I saw the leg meat had retracted from the bone some and the drumstick pulled out of the leg meat with a little bit of effort. I carved up the meat and put it in gallon Zip Loc bags separated into white meat and dark meat. There are also two smaller bags. One for a family member and one for a chef friend who I promised to let try it. 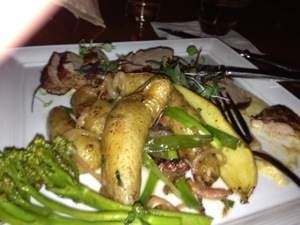 The meat was lightly smoky. The skin was brown and crisp. The meat was not overly salty and not spicy at all. It was a good, balanced recipe. 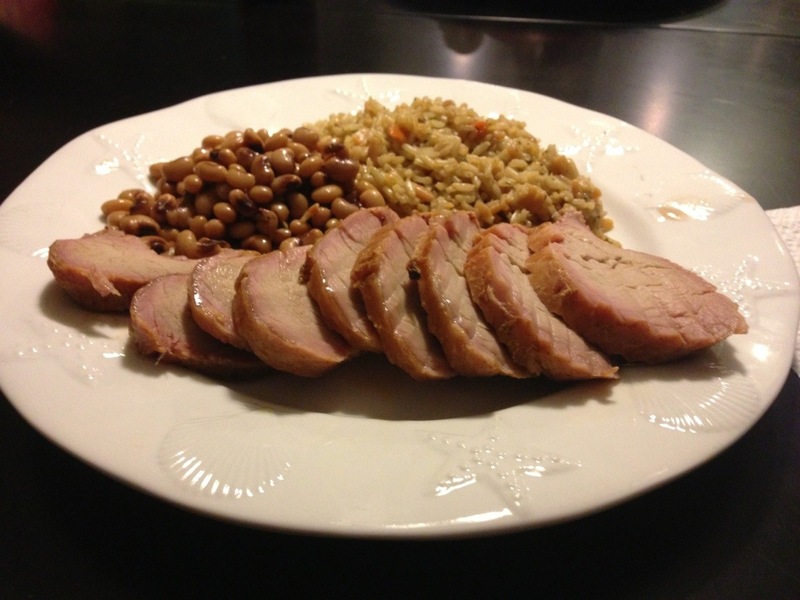 Although I might want to try a cajun turkey sooner or later, this is probably a relative crowd pleaser. 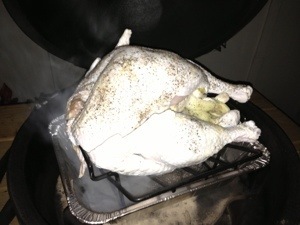 Heads up… the house stank of turkey, garlic and onion until I took the trash out. Bring on the in-laws! I’m ready for Thursday! 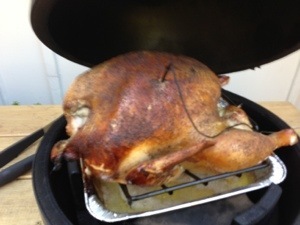 Staying with the official Big Green Egg recipe, here’s what happened for the practice turkey cook itself. 1. 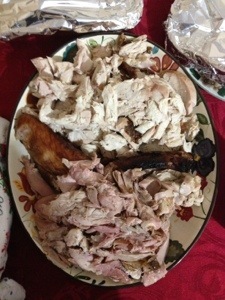 Remove the turkey from the brine, rinse well to remove the brining liquid, and pat dry with paper towels. 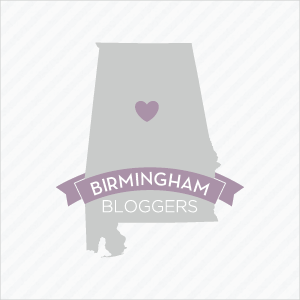 Discard the brining liquid and solids. 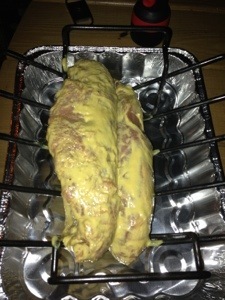 Place turkey in the V-Rack, breast side up. 2. 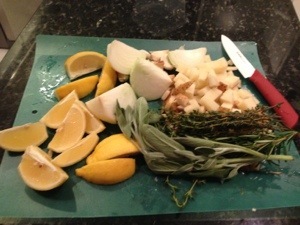 Stuff the turkey with the lemon wedges, the remaining halved garlic head and onion, thyme, sage, and potatoes. 3. 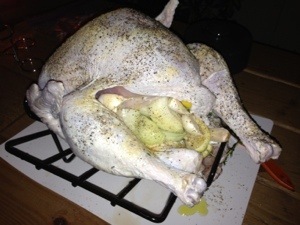 Brush the turkey with olive oil and season with pepper and garlic powder. 4. Fill a 1 gallon zip log bag with ice. Lay this over the top of the breasts for 20 minutes or so. Your turkey is done when the thighs are 180F and the breasts are 165F. This acts to give the breasts a lower starting temperature. I’ll get into how this worked practically in another post, but, having done it, you shouldn’t skip this step. This is PFM. 5. Put the V-Rack in the Drip Pan. Place the Drip Pan on the Plate Setter and close the lid of the EGG. 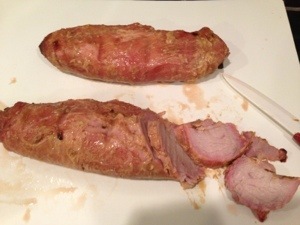 After I took the picture, I inserted a probe thermometer in the breast meat. It sounds an audible alarm when it reaches 165F. Cook for about 2½ hours. 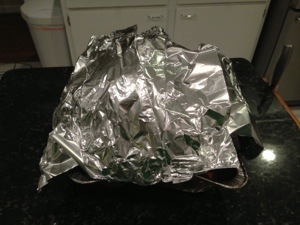 If the turkey starts to brown too quickly, carefully tent the turkey with aluminum foil. 6. The turkey is ready to remove when a pen thermometer reads 165F in the breasts and 180 in the thighs. Remove the entire apparatus from the grill and tent with aluminum foil. 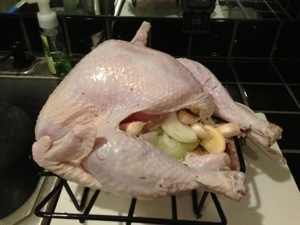 Letting the turkey rest for 15 – 20 minutes will let the juices redistribute properly. If you wrap the turkey tightly with aluminum foil and wrap it in a preheated towel, it will keep hot (HOT, not warm) in a cooler for hours. If you aren’t serving it immediately, it will keep in the refrigerator safely for a couple of days. 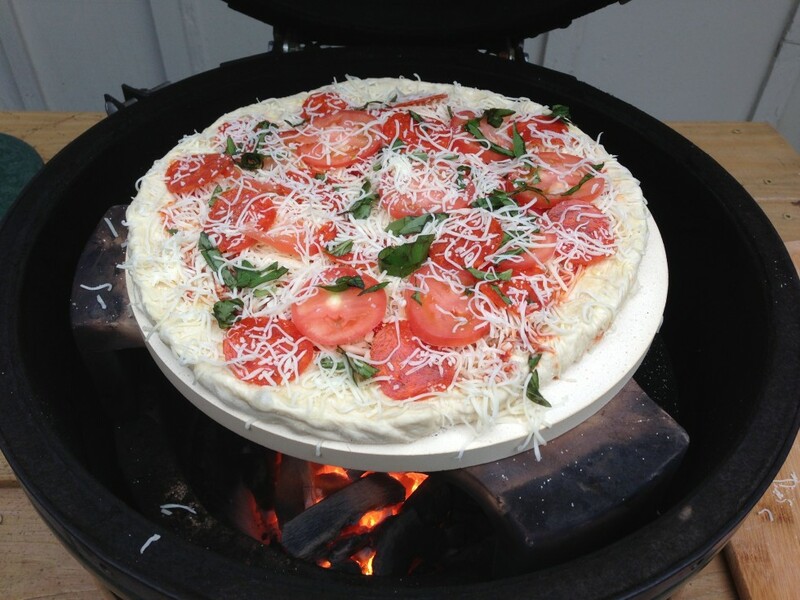 It’s still easier to heat up later if you carve it while it’s hot.